There is a term frequently used in exercise: “Setting the Pelvis”. This simply means: Let’s activate the muscles of the hips in a specific way to move them to a more neutral (or better) position–to balance them. We are going to use that term here to refer to the shoulder girdle. 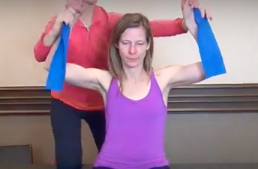 Here we begin to “set the shoulder girdle” by applying strengthening techniques to the muscles surrounding these three bones of the shoulder joint.